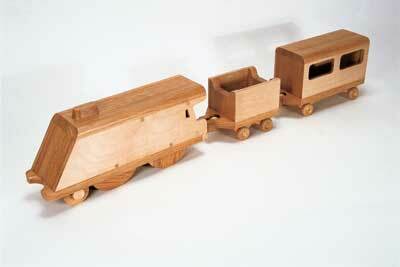 This train was made from birch (Betula spp.) 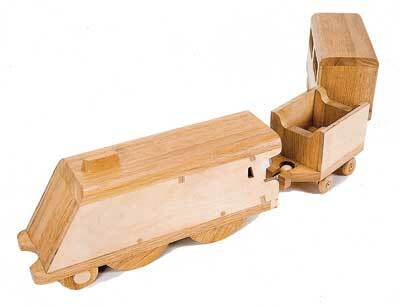 multiply, a material often used in the manufacture of wooden toys because of its close grain and clean edge when cut. 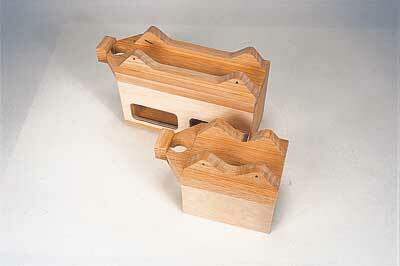 I decided to incorporate some oak (Quercus spp.) offcuts which I found for a reasonable price at a local boat yard. 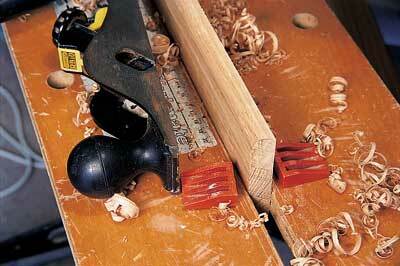 Suitable alternatives would be beech (Fagus spp. ), maple (Acer spp.) 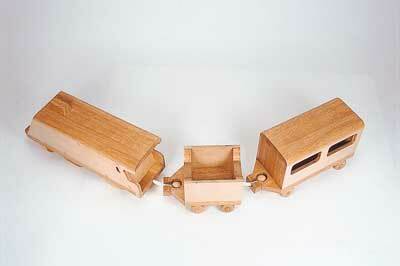 or even a good-quality softwood, although the wheels should be made from a hardwood. 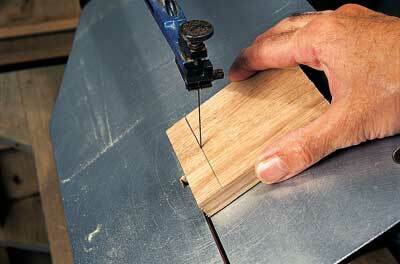 All gluing is with a PVA woodworking adhesive unless otherwise stated. Commence construction by sticking together two pieces of 6mm (1/4in) plywood with double-sided tape and mark up the engine sides. 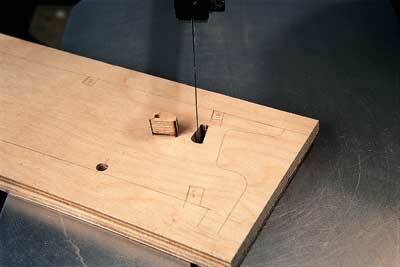 When marking up the notches use a scrap piece of plywood to make the measurement exact. 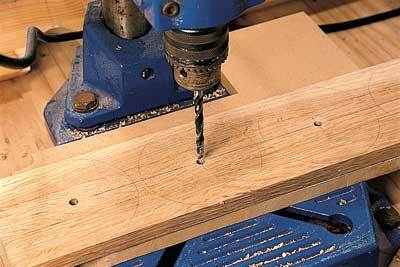 Next, drill two 6mm-(1/4in) dia. holes for the axles and a small hole in to the window waste area (see photo 2). Insert the scrollsaw blade through the hole in the window and fret it out (see photo 3), before cutting out the engine sides and then separating it. 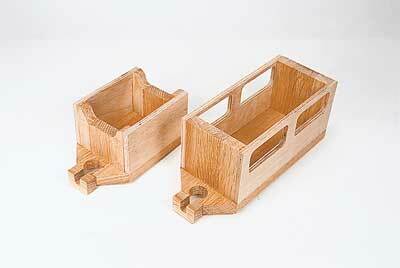 Proceed with the carriage sides in a similar fashion. Cut out the bulkheads and set the saw to a 16 degree bevel-cut when making the top and bottom cuts on the rear bulkhead (see photo 4). 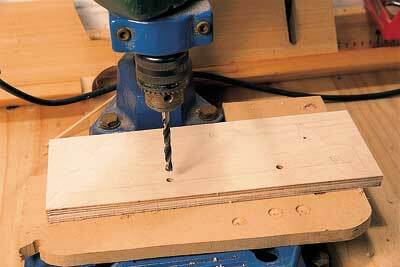 Mark up the engine chassis, drill a hole into each of the waste areas of the wheel cavities and fret out (see photo 5). Cut out the notches for the engine sides and the buffer shapes also. Cut out the engine roof with one end at a 30 degree bevel as well as the engine front (see photo 6). 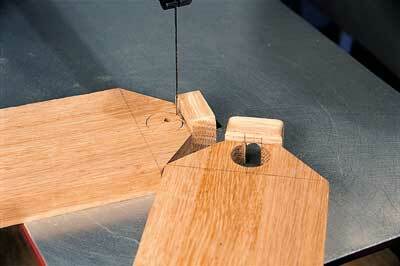 Mark up the radius for the edge on the ends of the engine roof and the carriage roof and plane to shape (see photo 7). 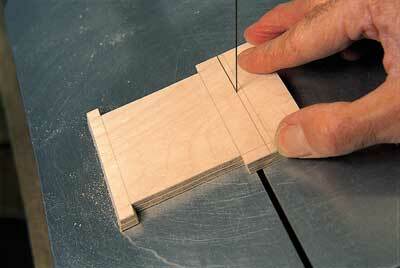 Cut out the funnel with the scrollsaw set at a 10 degree angle to give a slight bevel to its edge. 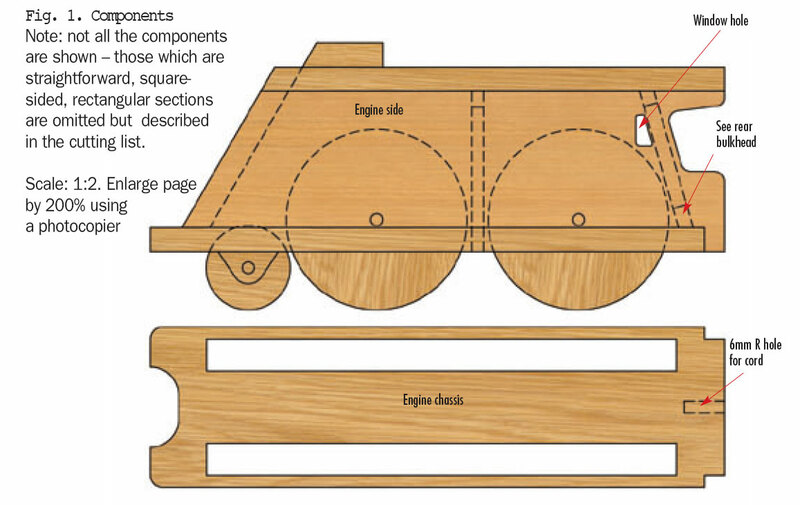 The next step is to mark up both the large and small wheels and the engine bogey supports onto the oak stock and drill out the 6mm (1/4in) axle holes before cutting out (see photo 8). Glue together the engine sides and the bulkheads using tape and clamps to hold them together, while setting as shown in photo 8. 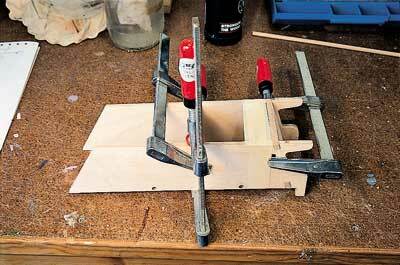 When set, glue the assembly on to the engine chassis and add the engine front (see photo 10). Cut out the axle supports and check that the notch for the wheel axle fits over a 6mm (1/4in) dowel. Insert 6mm (1/4in) dowels through the holes in the engine to act as guides for locating the axle support blocks. Put a little candle wax in the notches of the blocks before gluing in place (see photo 11) and finally, add the roof and the bogey supports. Cut out the carriage and tender chassis but do not cut out the coupling holes. Cut the two slots that make up the entrance to the holes only (see photo 12). 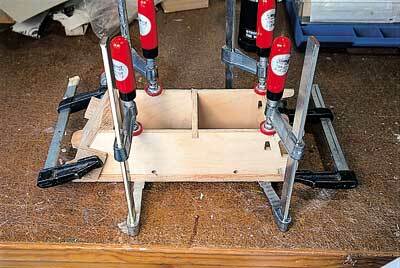 Drill holes into the waste area of the coupling holes and then glue the coupling parts to the chassis. When set insert the sawblade through the hole in the waste area of the couplings and fret out the holes as seen in photo 12. 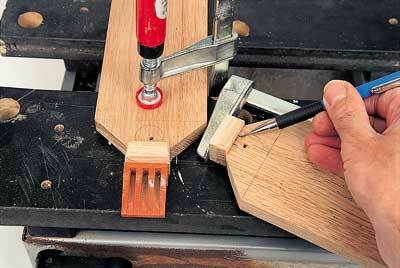 Shape the buffers at the front of the engine by rounding off the corners. 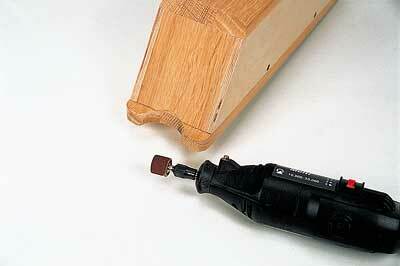 I used a mini drill with a sanding drum attached (see photo 14). Glue the tender and carriage sides to their respective ends and glue the assemblies on to their chassis (see photo 15). Tape and clamp while setting. Now, clamp and glue on the carriage roof and counterbore 3mm (1/8in) pilot holes into the axle screw positions on the tender and carriage wheel supports. 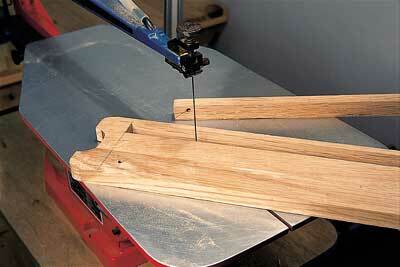 Countersink the holes on the outer surface of the hardwood wheels. 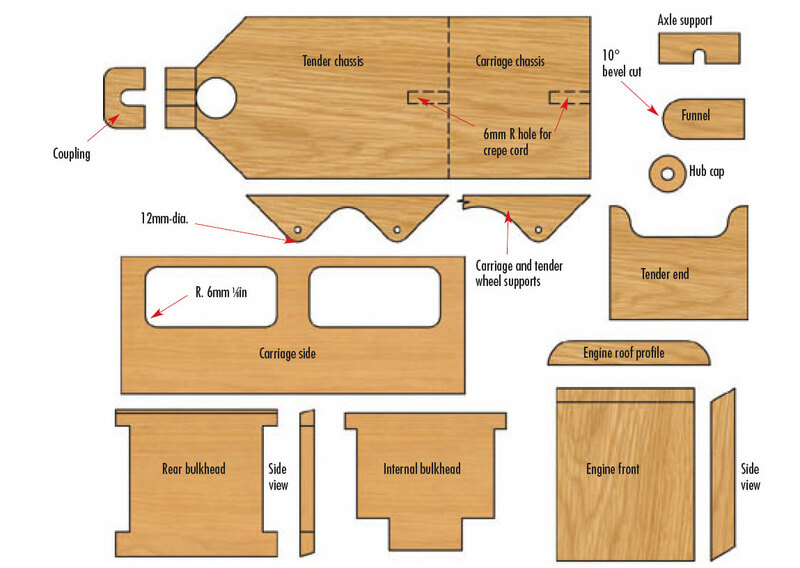 Glue the axle supports to the bottom of the tender and carriage 12mm (1/2in) in from the sides (see photo 16) and counterbore a 6mm (1/4in) hole into each of the hardwood balls using a vice and hand drill. Mark up the hubcaps and counterbore the 6mm (1/4in) axle holes before cutting out. Apply the finish. I used Rustin's acrylic satin varnish but if you prefer an oil-based type, try Japlac transparent lacquer. 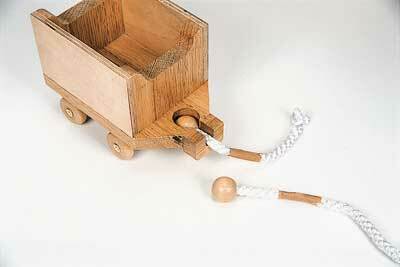 Attach the washers to the large wheels with double-sided tape or Superglue and align them with a dowel. 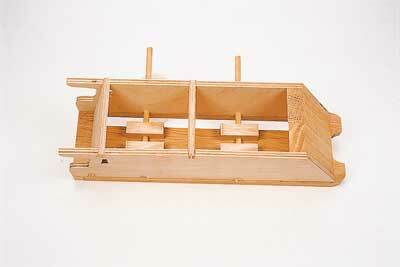 Place the wheels in position, insert the axles through the engine sides and finally glue in place (see photo 17). Glue a hubcap on to one end of the bogey axle and insert through a wheel, add a washer and insert through bogey axle supports. Adjust the axle to length and add the other wheel, washer and hubcap. Note that the hubcap will be slightly too large to fit so flatten one edge to get it to fit snugly under the chassis of the engine and fix with glue. 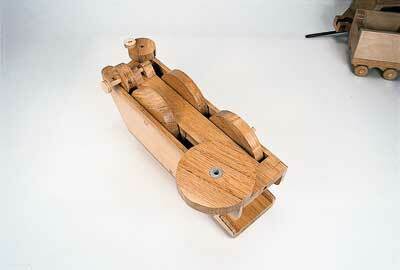 Attach the hardwood wheels to the carriage and tender with screws. As the screws were too long I cut a thread in the wood first by inserting and removing them and then cutting about 6mm (1/4in) off their ends. Add a dab of epoxy resin adhesive to the screw to prevent them wandering out. Use some gum strip to prevent the crepe cord from unravelling before trimming to length and gluing one end in to a 25mm (1in) ball and the other end in to the hole in the tender, carriage or engine chassis, as seen in photo 18. "Shape the buffers at the front of the engine by rounding off the corners"
2 x Hubcaps – 18mm-(3/4in) dia. 4 x Large wheels – 90mm (3 1/2in) dia. 2 x Small wheels – 42mm (1 5/8in) dia. 1 x Bogey axle 76mm (3in) approx.